Thanks for posting the excellent photos btw! FG-1D FAS-219 BuNo. 92690 shown here during the mis 60's.This aircraft was shot down by friendly fire in July 1969 during the 100-Hour War with neigboring Honduras.It still remains under 100 feet of water in the Gulf of Fonseca,south of Honduras. The Etchell Corsair i saw was in the blue faded paint.. But this brings me to a question. 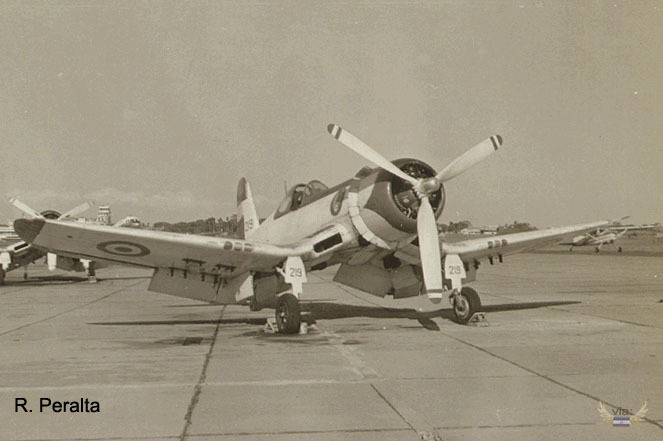 If memory serves me, there is a "birdcage" variant Corsair down in Australia, the only one of it's type if I recall. The last I heard of it, it was airworthy. Does anyone know if that is the case still ? Or has it's disposition changed in the past couple of years ?? IRRC There was a Bird Cage Corsair found in a barn near the Olathe Ks Naval Air Station. Is this the one? Let´s see if I can help you. FAS 207 (BuNr92690), was delivered to FAS in 1957 from Litchfield Park, AZ. It was part of the Dark Sea Blue FAS Corsairs (FAS 205-220). Operational career in El Salvador, seems to have been pretty short for FAS 207, as it missed the general overhaul to operational or "in good condition" FAS Corsairs performed at the beginning of the 60s by "Servicios Aerotécnicos Latinoamericanos S.A." No records of FAS 207 are available until 1966, when it is found pasturing at Ilopango, still wearing the same, but heavily-weathered, dark sea blue delivery scheme, w/o a canopy, rudder and missing several panels of the fuselage, evidently non-operational for long. Next report comes from 1971-72, when FAS 207 is found still wearing the same Dark Sea blue scheme from 1957 vintage, but somehow "complete" with other airplanes parts including fuselage and cowl panels, propeller, rudder, elevators, canopy, wings fabric, and looks like a new left horizontal stabilizer (couldn´t tell, yellow zc), either a "make-up" effort to sell it, or, less probable, to make it airworthy. For some reason, FAS 207 was not purchased by anybody... and it remained pasturing at Ilopango. FAS re-painted it in a spurious overall Dark Blue scheme, with white FAES lettering on the fuselage, roundels on the wings and blue/white/blue rudder. For some unknown reason, the original number 207 was changet to "220". Rumours say that they did the change in memory of a FAS commander whose favourite a/c had been 220, who knows. At the beginning of the 80s, it was exhibited at the entrance of an amusement park until the mid-80s, when it was returned to Ilopango, where it was again exhibited in the same spurious scheme. It was sold in 1992 to Dan Wirth and Yaron Degani, Miami, FL, reportedly with 2,224 hours of flight, to Aztec Capital Corp, Coconut Grove, FL, January 25, 1996-2008, Registered as N6143C, Restoration to airworthy, Santa Rosa, CA, 1995-2001. Without any doubt, this was the longest-serving Corsair in FAS inventory, from 1957 until 1992, but most of the time either in the junkyard or in static exhibition. The wrong dating of pictures showing FAS 207 with other a/c parts has resulted in the belief that it was operational during the 100 Hour War in July 1969, which is not true. Only operational Corsairs during the war were FAS 202, 204, 215, 219 and 220, as far as can be prooved. Now, regarding some other contents in the links that you posted, FAS 219 crashed at la Union probably July 16, 1969, reportedly shot down by friendly fire, pilot Liut M. Echeverría, managed to jump, injured but survived. The exact place where FAS 219 remainings can be found is not know to me, though, don´t know af any reports nor any pictures showing it. BuNr of FAS 219 in not known, somehow the post mistakenly mixes BuNrs of FAS 219 with FAS 207. It is risky to try to identify FAS tailnumbers by the BuNrs. Frequently, the BuNrs list provided in some bibliography, based on the records found in US government archives, is used to match it directly to the correlative FAS Corsair tailnumbers. This will result in several incongruencies as the BuNrs are not ordered to match the tail numbers. There are still several FAS Corsairs whose BuNrs are not confirmed or matched, among them FAS 202, 204 and 219, the three Corsairs lost during the 100 Hours War. 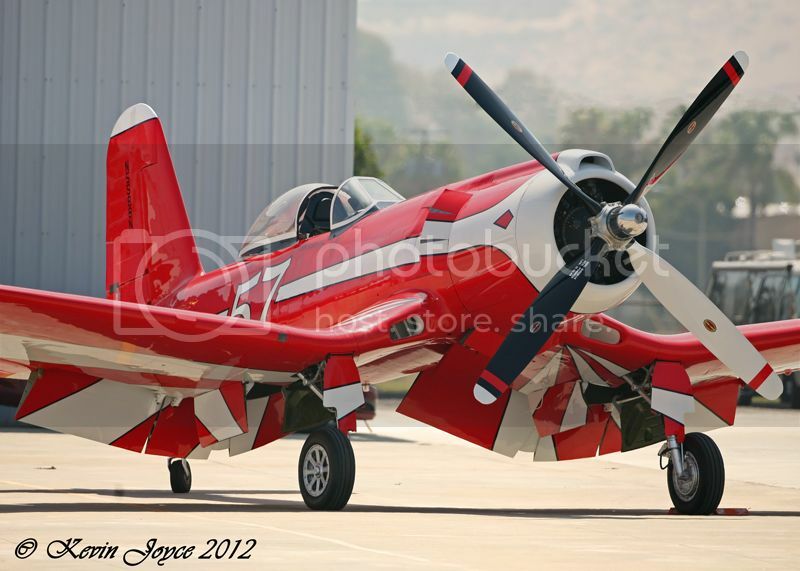 Race 57 from last weeks Wings Over Gillespie. Versatile: I agree with you! Buno 92690 was not a FAS 219 as previously mentioned. We'll find out the real Buno of FAS 219 when we send a ROV to its final resting place, off "Playitas" area in the Golf of Fonseca in some 700-800 ft of water. We 'll post later on how the real 92690 FAS 207 looked like when it was being worked on at Comalapa Air Base c. 1990s. (Prior to its sale to USA collectors). There is a poss F4U-1A with a birdcage canopy at Sao Paulo, Brazil Museum. I believe the whole plane came fm the USA sometimes c. 1970s. Pictures later on!! It came from New Zealand in the 1990's or early 2000's. Prior to that it was with Harry Doan, who restored it, and then Don Knapp before he killed himself in a mustang. Might have been another owner as well but I don't recall.